“The Boxer” is 80 year old Neo-Dadaist artist Ushio Shinohara. “Cutie” is his long suffering wife Noriko Shinohara. The two live and work in New York City and have ever since they originally met in back in 1973. Both were transplants from Japan. Back then he was 41. She was 19. He was a painter and sculptor – a rising star in the art world. She was a student. They got married and she not only became his wife but his de facto assistant as well. For you see, she put her own vocation on hold so she could support her husband’s career. Ushio is still producing art. While he struggles to affirm his legacy, Noriko is finally getting some deserved recognition. We see him creating his paintings by punching the canvas with boxing gloves dipped in paint. He also creates “junk art” sculptures composed of found objects with garishly colored paint. Motorcycles are a common theme. Her work consists of a progression of whimsical drawings depicting her own life with Ushio entitled ‘Cutie and Bullie’. Light animation has these figures parallel their real life counterparts at appropriate times throughout the documentary. Her voice representing a quietly fuming display of resentment. 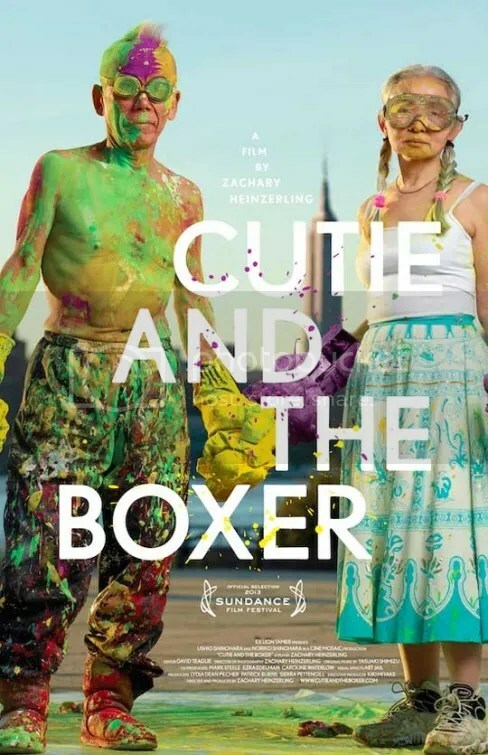 Cutie and the Boxer is not so much a story about artists but rather people in a 40 year relationship. The couple is a most curious pair. Ushio is small but physically scrappy. Although his work has been displayed at high profile museum exhibitions, his creations haven’t seen a great deal of monetary success. We see the two converse in a cluttered apartment in Brooklyn, surrounded by sculptures, scattered materials and cats. Their marriage comes across like a series of “what-coulda-beens”, “if-onlys” and “I -wish-I hads”. In speaking with the camera, Noriko detail a singular existence obsessively focused on her husband’s art career. She admits it has had an effect on their now 39 year old son. Alex is also a struggling artist and clearly uncomfortable on screen. His uncharacteristic upbringing hampered by his father’s alcoholism which now seems to afflict him. Cutie and the Boxer is mildly interesting, but it’s a depressing watch. There isn’t a lot of insight, but there is nuance. The director’s POV sides with Noriko for having set aside her own ambitions to take care of essentially two children, her son and husband. Ushio is seemingly oblivious or perhaps indifferent to his wife’s regrets. Her own artistic pursuits only now receiving some attention. Together the couple exhibit a competitive alliance regarding their individual careers. Because of all this, the production has an air sadness to it. Yet it’s a relationship that has endured for quixotic reasons, but there is hope here. Ushio inquires of Noriko, if Cutie hates Bullie. “Ah, Cutie loves Bullie so much,” she responds. This entry was posted on January 29, 2014 at 11:00 pm and is filed under Biography, Documentary, History with tags 2013. You can follow any responses to this entry through the RSS 2.0 feed. You can leave a response, or trackback from your own site. Has it gotten mixed reviews? That would make more sense to me. I just checked Rotten Tomatoes and it’s at 95%. Wow. yeah i tend to think R.T. overblows things quite often, but yeah, 95% doesn’t indicate mixed to me. those are also mostly ‘professional’ columns, i was more referring to the blogging community. Nice review. I have this bookmarked to watch but I just haven’t felt compelled to check it out, even with its Oscar nomination. I need to at some point. For some reason I have even less desire to see Dirty Wars and The Square but I will at some point before the Oscars on March 2nd. Dirty Wars is very flawed. Very. But The Square is excellent. I doubt it disappoints you. I’m pretty interested in “The Square”. May give it a look tonight. Great review, Mark. I agree, more or less. I think Cutie and the Boxer wants to be a document on relationships, but I also think it stumbles there. Because it is so one-sided. In that regard, I wish we had gotten to know know Ushio better. I don’t quite understand how the Academy puts this on in the same category as Stories We Tell, The Act of Killing and The Square, much how they think this one is better than one of those titles. This feels like one of those human interest stories they tack on at the end of a news broadcast. They’re usually only a few minutes long and you forget them right after you’ve seen them. That is, in point of fact, a great comparison. Well said. Great review, Mark. Still, can’t say I’m looking forward to this one. May watch just to catch up with the nominees. It’s not necessary unless you feel compelled to see all the nominees for best documentary. But there were better films not even nominated (Blackfish). Very curious about that one, especially since I grew up going to SeaWorld. You might not want to ever go back after seeing this. Good review Mark. I didn’t love this documentary, but what we get to see of these two is really wonderful to watch. However, it’s also very sad in how their past definitely has some serious consequences, mainly with their son. Yeah I wish the documentary had decided to delve deeper into his life. It was a pretty superficial handling of this story. I guess they went with how much they could actually get, however, you could tell that the film makers definitely wanted to dig and dive deeper into his life. wow. i thought it was remarkable, charming, funny and very poignant at the same time. I love the way it examined their gender roles, Noriko finally realizing her art and the beautiful animation. My favorite doc from last year. This was a cute movie with a cute little couple. I don’t know if it should have been nominated for Best Documentary, but I enjoyed them. They were feisty, funny, determined and so in love. That made it special to me. However, I also think, “Blackfish”, should have been nominated in its place. I give this 3 stars. This is woefully out of its depth in the Best Documentary Feature category. I never really knew what this movie was about, but it does look interesting. It’s been in my Netflix queue for quite a while now. Looking back, I feel like I was a little generous with the star rating.